Spoons. They're so simple. But Michael Ruhlman thought they weren't designed quite right, so he started bending them to make them easier for basting, skimming and scooping. Then a friend suggested he could make them so they looked nice - you know, instead manhandling the current spoons. And that's how Ruhlman's offset spoons ($19.95/3) were born and how he started his web store. Or at least that's what the video on his site depicts. I've been using these spoons for a while now, and I have to say that the downside was finding a place to put them. The bends, which are functionally a good idea, didn't make them great for storage among their straighter brethren. Right now they're living in a utensil crock, and that's working well enough and it keeps them readily available. The bends in the spoons do make them less awkward for scooping up pan juices to baste food, and for skimming the froth off the top of a simmering liquid. Meanwhile, the bend isn't so radical that it feels odd in the hand. Earthshaking? No. But I didn't expect them to be. Regular spoons do the same job, it's just that these make those particular jobs easier. So if you do a lot of basting or skimming, this shape makes more sense. There's also a set of soup spoons, so you can get that last bit of soup from the bowl in a more elegant manner. 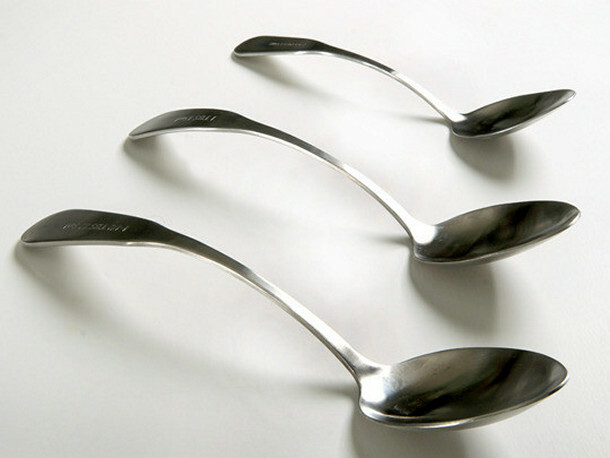 In theory, you could bend your own spoons if you have some that are sufficiently bendable, but if they're that bendy, they're probably not going to hold their shape all that well. And, if it matters, these look nice. Make Ahead Bread ... The Good Cook blogger event!